Andrew Grant's edge-of-your-seat thrillers have been hailed as "breathtakingly fast-paced" by Harlan Coben and as "smart, fast, and blazing with nonstop surprises" by Robert Crais. In this new novel of suspense, Detective Cooper Devereaux must chase down a cunning serial killer terrorizing the city of Birmingham, Alabama. woman disappears on her twenty-first birthday. The following day her body is found, wrapped neatly like a gift in a crumbling, sun-speckled graveyard. What does Detective Devereaux have to go on? Very little. No motive, no suspects. Then another victim is discovered in a crematorium parking lot. Again, she was killed on her twenty-first birthday. Again, her body was wrapped like a gift. By the third murder the tabloids have dubbed the homicidal monster the Birthday Killer—and Devereaux is under the gun. While Devereaux's own violent and mysterious past nips at his heels, and his fragile home life threatens to unravel, he can't afford to be anything but totally obsessed with the frantic search through the many layers of this city, from its wealthy enclaves to its dark criminal underbelly. The only certainty is that Devereaux is hunting a killer determined to fulfill a deranged agenda in which women's lives are extinguished like candles on a cake. 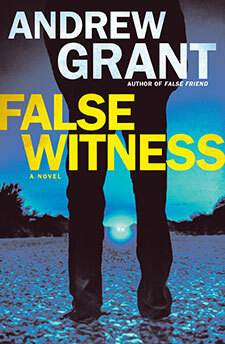 "False Witness is a heck of a great book." "...it will please suspense fans looking for a quick, high-stakes read." "Overall, a good story with a multilayered hero. The author's fans won't be disappointed."